This is the drug giant’s third shortage or stock out in less than one year of Bicillin L-A, Pfizer’s key syphilis drug; pregnant women with syphilis remain at particular risk of passing infection on to their newborns unless Bicillin L-A is available for treatment. NEW YORK (May 18, 2017) Health advocates from AHF and other groups hosted a midday protest in New York City today in front of the corporate headquarters Pfizer, the world’s third largest drug company, to protest a shortage or drug stock out of the drug giant’s key syphilis medication, Bicillin L-A (Penicillin G benzathine). This is Pfizer’s third shortage of the medicine—which is the only treatment recommended by the CDC for pregnant women with the infection—in less than one year. AHF first sounded the alarm about the dangerous Bicillin shortage in May 2016 and then again in December 2016. Yet, the FDA and the Centers for Disease Control and Prevention (CDC) simply repeated the explanation from Pfizer, the producer of Bicillin, that manufacturing contamination caused the shortage. The shortage has recurred today, leaving health providers, particularly those treating pregnant women, scrambling for supplies of the drug. This month, the New York Department of Health issued an advisory to update the community of the status of the continuing shortages of Bicillin L-A. 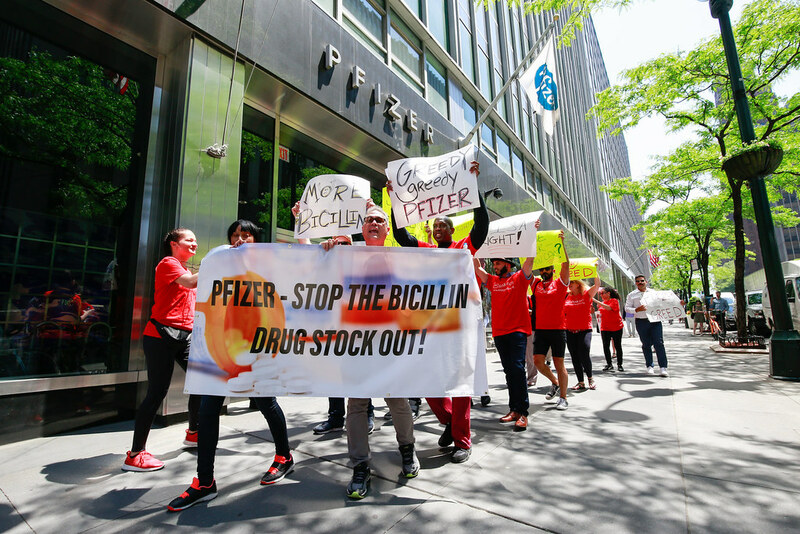 Today’s protest in front of Pfizer’s headquarters at 235 East 42nd (between 2nd & 3rd Avenues) is intended to attract attention to the ongoing stock outs or drug shortages as well as attract the attention of Pfizer employees as they come and go for lunch and business appointments. The infection rates of primary and secondary syphilis are at a record high. From 2014-2015, the national rate has increased 19 percent. The CDC continues to recommend Bicillin as the first line regimen for treatment because it is one of the most effective tools in addressing this public health crisis. Treatment alternatives such as Doxycycline can’t be considered as a reasonable replacement as Doxycycline can’t be administered to pregnant women and because the dosage requirements create serious adherence challenges for patients.